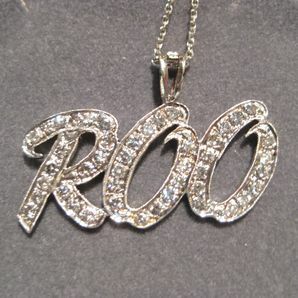 Do you have an idea for custom name pendants, something with your business logo, or a pendants with words on it? We can make almost anything you throw at us and for less than you might think. We have created hundreds of custom pendants for satisfied customers…don’t settle for chain store, mass produced jewelry! Contact us for custom name pendants or pendants with words. We can create custom name pendants in 1 piece up to 2 3/4 inches wide or tall in Bronze, Brass, Sterling or Argentium Silver, white, yellow, or rose Gold, Palladium or Platinum. Larger pieces are possible if we cast them in two pieces and then solder them together. We have hundreds of fonts to choose from, but am not limited to those. Send us your idea and let’s turn your idea into a reality. Click HERE to see another of our custom name pendants. Click HERE to learn more about custom jewelry, to see more name necklaces, or to contact us about a name pendant. It can cost less than you think to have your very own custom name pendants necklace made just for you. Why hassle with the retail stores for boring and overpriced neckwear when we can make what you want?